Since the sacking of Roy Hodgson, Liverpool has shown much improvement. Kenny Daglish took over January 9th 2011 and his debut game as a manager was against Manchester United in the 3rd round of the FA Cup. Liverpool has an English Premier record of 2-1-1 since the King took over. The team has now managed to climb the League standing to seventh place. It seems Daglish has become comfortable again on the throne. Daglish was a Liverpool star back in 1985. He took over as a Player- Manager in 1985 and won the league championship, topping Everton. In 1988 Daglish signed key players like Steve McMahon and Steve Nicol. Steve Nicol is the manager of MLS team New England Revolution. Daglish and his signing then went unbeaten for 37 straight games in league and cup play. The streak ended against Merseyside rivals Everton. Daglish won respect from many people after the Hillsborough Disaster claimed 96 lives. Daglish attended many funerals and so did his players. He resigned on February 22 1991. 517 appearances, 107 goals, 307 as a manager, 8 league championships, 2 FA Cups, 3 European wins, 4 league cup wins, one European Super Cup Award, and 5 charity shield wins. The list goes on for awards. He won three Manager of the Year awards and Football Writers Footballer of the Year Award. Since he dominated every competition and was a superior player-manager, the Liverpool supporters nicknamed him King Kenny. Liverpool has changed immensely since the King has returned to the throne. Young players like Martin Kelly and Jonjo Shelvey are seeing serious playing time. They are contributing to the team with their explosiveness and veteran like plays. Some other players are getting more PT like 31 year old Fabio Aurelio. The most impressive player by far is Raul Meireles. He has scored two goals and three assists so far this season. The Wednesday game against Fulham was a 1-0 victory for the Reds due to an own goal but Meireles was in the middle of the action and could have been credited for the goal. It seems Fernando Torres has his step back as his high paced runs seem to disorient the defense. The most impressive win under the King was against the Wolves. The Reds defeated the Wanderers 3-0. The goals were scored by Meireles and Torres, Torres has two by the end of regulation. Martin Kelly started as Jonjo Shelvey subbed in for Christian Poulsen. The team has shown such promise and the games are exciting to watch. Under Hodgson the games were boring and any lead Liverpool had would be equalized because his tactics forced the Reds to sit back and hold the lead. Kenny Daglish has sparked something in Liverpool and the pistons seem to be firing at max horsepower. The pedal is to the floor and the Reds have no expectation of looking back. Kenny Daglish commented after the Fulham game, ''I think we are better than that,'' he said. ''It is getting a bit more realistic but we are not getting carried away with being seventh - that is not where this football club wants to be. We want to be further up than that but to do that we have to win more games and that is what we will try to do, starting against Stoke next Wednesday''. Liverpool’s most exciting transfer news is Luis Suarez. Suarez is currently playing for Ajax and his club wants 21 million pounds and Liverpool has offered only 12.8 so far. Club Ajax has set a deadline of this Satuday. Liverpool needs to make a decision whether to give the asking price. The Reds want Suarez as they have sold Ryan Babel to TSG Hoffenheim. I see much promise for Liverpool continuing their streak under King Kenny. He is great in making player personnel decisions and with that more unfamiliar players will see time on the pitch. 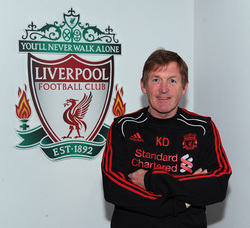 The Reds supporters would love to see King Kenny return to his throne after such a long time.